Nearly a thousand pages across two excellent, recently published biographies on Benjamin Netanyahu can be distilled into two words, the juggler: a man who has no horizon and no vision, all his efforts concentrated solely on the balls in the air, to ensure that his act does not end in ignominy. These descriptions are apt. Often referred to as “the magician” by admirers, Netanyahu has been too busy juggling to lead. Therein lies Israel’s tragedy: its slide from a Jewish and democratic state toward a dark place where democracy is in danger, judicial independence under threat, freedom of expression increasingly considered sedition, the media vilified, the fringes emboldened and Israel’s relations with the Diaspora stretched to breaking point. For many years, Ronald S. Lauder – heir to the cosmetics conglomerate whose name he bears – was one of Netanyahu’s staunchest supporters, their relationship dating back to Netanyahu’s stint as Israel’s ambassador to the United Nations, between 1984 and 1988. Together, Lauder and Netanyahu exposed then Austrian President and former UN Secretary-General Kurt Waldheim as a Nazi intelligence officer during the Second World War; together, they drew up a list of wealthy Americans who would help propel Netanyahu to the pinnacle of Israeli politics. Caspit describes Lauder as “one of [Netanyahu’s] oldest and closest patrons in America” – once so close that the Prime Minister entrusted him with delicate and secret missions, specifically to the late Syrian President Hafez al-Assad with clear instructions to scupper any deal that would return the Golan Heights to Syria. It was Lauder who found the money to finance Netanyahu’s first campaign for the premiership in 1996, and Lauder who brought in Arthur Finkelstein, the top-flight American political consultant and pollster to help ensure (at $1000 an hour) a Netanyahu victory in that election, the first of his four stints as prime minister which, though nonconsecutive, amount to a record held only by one other in Israel’s history – David Ben-Gurion. Three former members of Netanyahu’s unit – who, incidentally, saved Netanyahu’s life during a 1969 mission, when he fell into the Suez Canal after the team’s dinghy was hit by Egyptian fire – recently broke their silence to publicly voice their concerns over where Netanyahu was leading the country. In an open letter published by Israel’s leading daily Yedioth Ahronoth in August 2018, they wrote: “We see ourselves as especially close to you. We carried together, fought together and always relied on each other. Their voices will not be heard. Nor will Lauder’s. They are yesterday’s men, an anachronism in Netanyahu’s ambition to retain power. They don’t represent his voter base; the ideals they refer to have become foreign to Netanyahu, the juggler. In their place, he has found new allies and allegiances, like US President Donald Trump. Xenophobia, a hatred of the media, of asylum seekers, of liberals, of the justice system, of ethnic minorities – these are the values, if you can call them that, embraced by Netanyahu today, as both books make abundantly clear. With Trump in office, Netanyahu no longer has the need for a “rear guard” of American Jews to safeguard Israel’s interests. Diaspora Jews don’t vote in Israel’s elections, and are thus of no importance to his future. As for his former comrades-in-arms, their utility to him is less than marginal, their views on national unity and democracy irrelevant to a man whose loyalty to others is defined only by their utility in securing his hold on power at any given time. All this said, it would be a mistake to underestimate Netanyahu. One just has to read the narrative of his ascension to power in both these books to understand how relentless, cunning and formidable an opponent he can be. Time after time, after pundits dismissed him as a lame duck, Netanyahu found a way to bounce back. Take the rancorous 2015 election. Netanyahu trailed in the polls against his opponent Isaac Herzog, of the seemingly ascendant Zionist Union, and faced deposition from the ranks of his own Likud party. Everything seemed to be aligned for him to fail: rising housing prices; a protracted and costly – and inconclusive – 50-day war against Hamas in Gaza in the summer of 2014; and a raft of media stories reporting on greed and waste in the Netanyahu household at the expense of the taxpayer, charges validated by the State Comptroller just weeks before the election. “It was during these days that, against all odds, he was infused yet again with the ‘Bibi Spirit’ made famous in his first campaign,” Caspit writes, referring to Netanyahu’s victory against Shimon Peres in 1996. That election had taken place just six months after the assassination of Yitzhak Rabin; Netanyahu, in the eyes of many in the public, was partially responsible for this tragedy. “Call it the spirit of resolve, the refusal to quit, the code of the last man standing,” Caspit writes. As the 2015 campaign came to a close, despite the heavy shadow of failure hanging over him, “Netanyahu worked around the clock, gripped by a manic frenzy…sleeping a mere three hours a night. “When his adversaries rest, Netanyahu forges forward,” Caspit observes. With great accuracy, he describes the prime minister as “an obsessive, relentless fighter” for whom “failure is not a legitimate option”; for Netanyahu, all means are legitimate in the quest for victory. Caspit might have added “incredibly smart” to this list of Netanyahu’s attributes. One can deduce this from his brilliant decision in 2015 not to fight Herzog and the Left, but rather to focus on garnering support from the Right, drawing in votes for the Likud at the expense of his traditional allies in the settlement-oriented HaBayit HaYehudi (The Jewish Home) party. With the help of his campaign operations manager Shlomo Filber (currently a state’s witness against Netanyahu in the series of corruption scandals surrounding the prime minister), Netanyahu invited a group of settler activists to his residence for a private meeting. With Trump in office, Netanyahu no longer has the need for a “rear guard” of American Jews to safeguard Israel’s interests. Diaspora Jews don’t vote in Israel’s elections, and are thus of no importance to his future. An example of Netanyahu’s capitulation to the extreme right-wing elements of his coalition – who, incidentally, represent less than ten percent of the electorate – can be seen in the legislation rushed through by the government in the days immediately preceding the Knesset’s 2018 summer recess. In the words of a press release issued by the Association for Civil Rights in Israel at the time, “the right-wing, religious coalition that rules Israel’s Parliament moved aggressively this week to push through its polarizing agenda. “On Monday, it empowered the education minister (Jewish Home leader Naftali Bennett) to bar some groups that criticize the Israeli occupation of the West Bank from speaking in public schools. On Tuesday, it accelerated what critics call the creeping annexation of the West Bank, by cutting off Palestinians’ access to the Supreme Court in land disputes. On Wednesday, it blocked single men and gay couples from having children through surrogacy. “The capstone,” the press release concluded, “came Thursday, with passage of a law granting the Jewish people an exclusive right to national self-determination,” thereby denying de facto equal rights to Israel’s non-Jewish citizens. These include the Arab minority, who constitute 20 percent of the country’s population, and the Druze community, which has served the country faithfully, rising to senior ranks in the security services and paying for their loyalty to the State with their lives. What emerges from both these biographies is a palpable sense of disappointment. Netanyahu has every qualification to be a great leader: articulate, educated, experienced, an officer in what was then the most elite unit of the Israeli army. With double degrees earned in record time from America’s top universities, he became an outstanding diplomat and finance minister; as Israel’s almost longest-serving prime minister, he is deeply schooled in the machinations of Israeli politics. But he has a deep character flaw, one that emerges time and time again throughout both books: Netanyahu lacks backbone. One vivid example of this is his relationship with his third wife, Sara, who seems to have him totally and absolutely under her thumb. Constantly at his side, she insists on being present at most meetings the prime minister holds, including those where highly classified issues are discussed with the country’s security chiefs. She is said to have the last word on official appointments and the word is that no one can survive her disfavor and continue working on the affairs of state. An example of this was the refusal of the deputy head of the Mossad, Ram Ben-Barak, to interview for the top post when, by his own account, he heard that Sara Netanyahu would be present. Both writers attribute this to a contract Mrs. Netanyahu forced her husband to sign on the eve of the 1996 election, after he admitted on national television to having an extramarital affair with a member of his campaign staff. She threatened to throw him out; he begged for forgiveness, knowing that a third divorce would not go down well with his largely conservative support base. The agreement tying her destiny to his was signed, making him more like a puppet on a string than a leader. Netanyahu also lacks consistency in his policies. The 1996 election was grounded in his opposition to the 1993 Oslo Accords between Israel and the Palestinians. His campaign was anchored by two slogans: “Peres will divide Jerusalem” and “Bibi is good for the Jews.” Pfeffer – a correspondent for The Economist, and a senior reporter for Israel’s left-leaning Haaretz newspaper – describes what happened next in a chapter aptly titled “Israel’s Serial Bungler,” his vivid account leaving the reader reeling from the flip-flops that follow. In his victory speech four days after the election, Netanyahu declared that “we intend to further the process of dialogue with all our neighbors to reach a stable peace, a real peace, a peace with security.” Yet it took almost three months of cajoling and pressure from both the Americans and Israel’s president at the time, Ezer Weizmann, before he agreed to meet the Palestinian leader, Yasser Arafat, ostensibly to further the peace process between the sides. Days later, however, in order to appease his right-wing constituency, he authorized the building of 1,500 new homes in the West Bank settlements and threatened to close down Orient House, the PLO’s “foreign ministry” in East Jerusalem – gestures guaranteed to undermine the peace process he was supposedly committed to. He followed this with the decision to open a tunnel under the Western Wall adjacent to Temple Mount in clear violation of the agreement between the parties to maintain the status quo on the potentially explosive issue. The predictable outcome was mass riots in East Jerusalem, in the West Bank and in Gaza. By the time Arafat finally reined in his forces, 17 Israeli soldiers and nearly 100 Palestinians had been killed, and trust between the Palestinian Authority and Israel’s security forces had broken down. The Americans were furious, as was Jordan’s King Hussein, who was reported to be reconsidering the peace agreement he had signed with Israel in October 1994. Alarmed, President Bill Clinton summoned the three leaders to a summit, which took place in Washington at the end of September of that year. “At the White House,” Pfeffer writes, “Hussein spoke to him [Netanyahu] sternly, accusing him of arrogance and disrespect. A chastened Netanyahu sat by Arafat on a couch and began to work his charms. Bizarrely, it seemed to work as the two men sat for hours. ‘I found a friend in the White House’ Netanyahu announced,” referring to Arafat – words few, especially in his own party, expected to ever hear from Netanyahu’s lips. Netanyahu also agreed to enter into negotiations on the outstanding and prickly issue of Hebron, a city claimed as holy by Jews and Muslims. Netanyahu, according to Pfeffer, “had promised the settlers and Chabad rabbis that he would stand by them saying ‘you can trust me on Hebron’” in the run-up to the election. Now, he was agreeing to its division in what Pfeffer describes as a “miserable compromise”: 80 percent of the city coming under Palestinian rule, and the 450 Israeli settlers there – less than 0.13 percent of the population – left in place, surrounded by hostile neighbors. “For the first time, a Likud prime minister had ordered Israeli troops to pull out from parts of the historical Land of Israel and (allowed) the Palestinians to take control of a piece of the historical Jewish homeland,” Pfeffer writes – an act at odds with everything Netanyahu had ever believed, and in direct contradiction to what he had been weaned on by his father and grandfather, both ardent supporters of a Jewish homeland with the biblical territories of Judea and Samaria at its very heart. Netanyahu paid the price for this flip-flop when Ehud Barak defeated him – by 16 percentage points – in the 1999 elections. But like all good jugglers, he was able to pick up the pieces. After a short break from politics, Netanyahu returned to the cabinet table in 2002, first as foreign minister and later as an extremely capable finance minister in the Ariel Sharon administration of the early 2000s. Netanyahu broke from Sharon over the latter’s decision to unilaterally withdraw from Gaza in 2005; he became chairman of the Likud and head of the opposition in 2006, and battled his way to the premiership in 2009, where he has been ensconced ever since. These two biographies are insightful and knowledgeable but different. 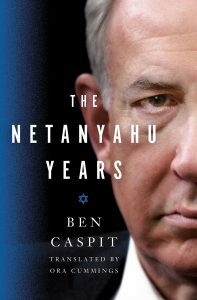 While Pfeffer’s book weaves Netanyahu into Israel’s story, Caspit’s book focuses on Netanyahu with Israel’s history as a backdrop. Pfeffer’s book reads like it has been written from a stack of impeccably organized two-by-four cards; with Caspit you feel like you are in the room while history is being made. At times, Caspit seems inordinately harsh in his criticism; Pfeffer, on the other hand, takes on the role of an apologist for Netanyahu’s actions. Take, for example, Caspit’s passages describing Netanyahu’s meeting with President Barak Obama in May 2009, shortly after the formation of the second Netanyahu government. Caspit describes Netanyahu’s “white-knuckled” nervousness during the trip from Israel to the US, knowing that one of Obama’s goals was nuclear disarmament and fearing for the long-standing US-Israel “understanding” in this regard, American support for Israel’s official “ambiguity” on the subject of its nuclear weapons going back to the 1970s, under Richard Nixon and Golda Meir. Nothing, however, had prepared Netanyahu for the dressing down he was to receive in private from Obama on the settlement issue – the harshness of which his advisors had not prepared him for, an oversight which earned them the full force of Netanyahu’s wrath. Netanyahu, according to Caspit, expected Obama to demand a decrease in construction in the West Bank, but believed he could get the Americans to agree to continued Israeli building in the settlement blocs. How wrong he was. The Israeli delegation were received cordially, but then came the one-on-one meeting between Obama and Netanyahu in the Oval Office, an off-the-record discussion which lasted some two hours and from which Netanyahu emerged ashen-faced. “It was one of the hardest meetings Netanyahu had ever endured: stuck in a closed room with no witnesses or documentation, and the leader of the free world had given him a fierce slap across the face,” Caspit reports. “‘I demand’ said Obama, ‘that you stop building on the West Bank.’ Netanyahu cleared his throat, tried to bargain, asking: What about the settlement blocs, the agreements? 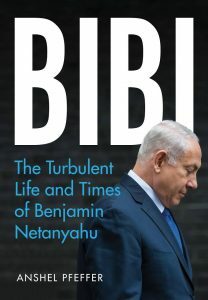 Both authors are eminently qualified as veteran observers of Israeli politics to write these biographies of Netanyahu. At times, Caspit seems inordinately harsh in his criticism; Pfeffer, on the other hand, takes on the role of an apologist for Netanyahu’s actions. Pfeffer’s greater amenability to Netanyahu is particularly evident in his account of the events and incitement leading up to the November 1995 assassination of Yitzhak Rabin – Rabin who had signed the Oslo Accords, shaken Arafat’s hand and embarked on a process that could have led to an eventual Palestinian state. Really? Even though his book is replete with footnotes, Pfeffer provides absolutely no proof, nor cites any source, for Netanyahu’s supposed selective hearing or the doctoring of television reports from the scene. He also sometimes wears his political beliefs on his sleeve. One example is when he writes, in his own words, how Netanyahu agreed that he would abide by the agreements reached by the Rabin government because “Arafat was a congenital liar and unreformed terrorist” and would not keep to his side of the bargain, thus absolving Netanyahu from following through on his commitment. This shouldn’t, in itself, detract from the importance and relevance of Pfeffer’ book. But there is nevertheless an underlying, somewhat troublesome tone, one that leaves the reader with the impression that he is pulling his punches, not wanting to cut his ties with an incumbent prime minister, given the importance of access to him and those around him to Pfeffer’s journalistic career. Conversely, with Caspit, one feels that his bridge to Netanyahu was burned a long time ago, allowing his pen to flow more freely, albeit perhaps not always fairly. Personally, I learned a lot – and most of this is extremely worrying – from both books, information validated by the Lauder column in The New York Times and the open letter from Netanyahu’s former comrades-in-arms. Netanyahu is a man who lacks consistency, who bends in the wind, who will stop at nothing in his quest for power. For Netanyahu, the end always justifies the means, no matter what collateral damage is done along the way to Israel’s place among the nations as the only enlightened democracy in the Middle East. He comes across as a man for whom loyalty is a transient concept – a trait that has come back to bite him, with many of those formerly close to him now serving as state’s witnesses, willing to testify in the myriad of criminal investigations currently hanging over Netanyahu and his family. The glimpses from the books into his upbringing – the sternness of his father, quick rod of his mother, his adulation of his brother Yoni and the long periods living in the US, partly under the pseudonym of Ben Nitay – are all fascinating, relevant to those who want a psychological profile of Netanyahu, as well as to those who want to understand the contradictions that define the man. But what comes across strongest of all in these biographies is that above all, Netanyahu remains a juggler, swapping the balls in the air from time to time to allow the act to go on; but at the same time devoid of vision or the ability to see any horizon beyond the balls in the air. The act will end in ignominy, though; he will continue to juggle with dexterity and vigor until the audience gets the point, and stops applauding. Judging from these two biographies, that moment cannot come quickly enough. Hirsh Goodman is a journalist and editor, the founding editor-in-chief of The Jerusalem Report.